When Fox’s Breaking In returns for its second season, it will have many challenges to overcome. For one, it’s on a network with few live-action comedy hits at the moment, due in part to the fact that it has few non-American Idol time slots available for programming. For another, viewers who see its title come up on their digital TV guide may muse, “I thought that got canceled?” Which it did. But then Fox un-canceled Breaking In, and its producers made a serious bet on the show’s potential for longevity: They added Megan Mullally as a series regular. blah blah blah (I didn’t watch it and neither did you; that’s why it got canceled). Many will remember her playing her best-known TV role: Karen Walker on Will & Grace, for which she was Emmy-nominated seven times (winning twice). They’ll recognize that she’s an attractive, funny lady. They might have puzzled at her ads for I Can’t Believe It’s Not Butter. But comedy nerds know better: They might not even remember Mullally as Karen because they’ve spent the last half-decade watching her tear up virtually every important sitcom on TV. 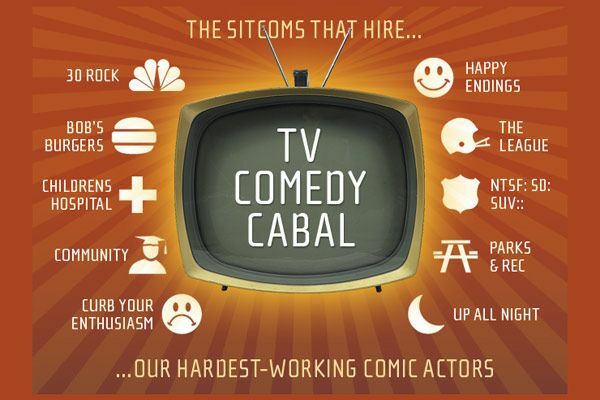 If you are a comedy nerd who still mourns Arrested Development, who watches every live-action show on Adult Swim, and who’s addicted to comedy podcasts like Comedy Bang Bang, there’s a cabal of performers you can’t escape. (Not that you would want to. There’s a reason they keep getting the work.) Many of them have a shared background in the Groundlings or at the Upright Citizens Brigade theaters in New York and Los Angeles. Many of them also pop up in ensemble comedies like My Idiot Brother and I Love You, Man. It’s a group whose members’ reliable good taste means that, when you see them guesting on sitcoms, it assures you that you’re consuming the right shows. And now, a mathematical investigation into who among this group of actors makes the most sitcom appearances — as well as which sitcoms employ the most of them — has refined a mess of data into a snapshot of the truly most valuable actors AND the most unmissable TV comedies. What was then indisputably left as the most essential ten shows and fourteen performers are represented by this chart. You might never have guessed that Brian Huskey is closer to the center of contemporary TV comedy than Jason Sudeikis. Now you know it’s true. Ed. note — the original chart has been amended to include Matt Walsh and Nick Kroll. We beg the TV Comedy Gods to forgive the initial oversight. When writer Tara Ariano and designer David T. Cole aren’t watching TV, they are arguing about getting a dog. They live in New York City.